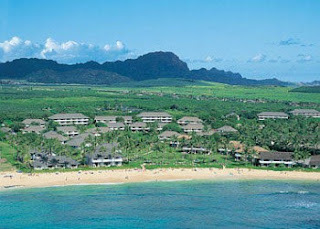 Kiahuna Plantation occupies a lovely beachfront in Poipu on the sunniest side of the island. The architecture at this picture-perfect oasis by the sea is reminiscent of Hawaii's 19th-century plantation past. The atmosphere is relaxed and carefree. Swaying palms, shady monkey pod trees, and delicate plumeria blossoms accent the manicured lawns that carpet the 30-acre setting. A pristine stretch of sand invites you to swim and snorkel in the clear blue Pacific.